The Pinnacle 350R features a table-top, display Doppler with superior sound quality, PC-style cable locking system, extended battery life, enhanced probe sensitivity, interchangeable probes and a one-year full warranty. The 8 MHz vascular probe is designed to ease location of surface vessels. The narrow beam and pencil-style shape provides optimum sensitivity and ease of use. (It is the best general purpose vascular probe). Ultrasound Probes/Dopplers can be found in our extensive online collection of products from globally recognized and trusted brands, including Summit Doppler. 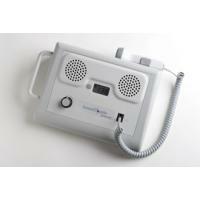 An excellent option to consider is the Pinnacle TableTop Display Doppler with Recharger.